Drawing on the work of leading researchers and practitioners from a range of disciplines, including economic geography, economics, economic history, finance, law, and public policy, this edited collection provides a comprehensive assessment of stranded assets and the environment, covering the fundamental issues and debates, including climate change and societal responses to environmental change, as well as its origins and theoretical basis. The volume provides much needed clarity as the discourse on stranded assets gathers further momentum. In addition to drawing on scholarly contributions, there are chapters from practitioners and analysts to provide a range of critical perspectives. 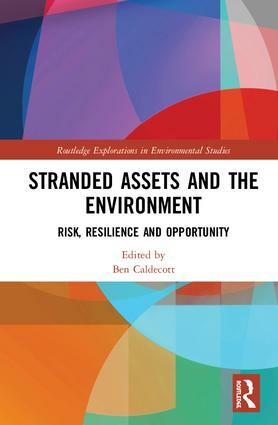 While chapters have been written as important standalone contributions, the book is intended to systematically take the reader through the key dimensions of stranded assets as a topic of research inquiry and practice. The work adopts a broad based social science perspective for setting out what stranded assets are, why they are relevant, and how they might inform the decision-making of firms, investors, policymakers, and regulators. The topic of stranded assets is inherently multi-disciplinary, cross-sectoral, and multi-jurisdictional and the volume reflects this diversity. This book will be of great relevance to scholars, practitioners and policymakers with an interest in include economics, business and development studies, climate policy and environmental studies in general. 10. Climate change: what implications for central banks and financial regulators? 12. Stranded assets as economic geography: the case for a disciplinary home? Ben Caldecott is the Founding Director of the Oxford Sustainable Finance Programme at the University of Oxford, UK. He has pioneered key concepts in his field, including the concept of ‘stranded assets’ and is the leading academic researcher in this area internationally.